The AmD with Cobra Exhausts team enjoyed a strong weekend on track at Oulton Park to secure a top ten finish from the latest rounds of the Dunlop MSA British Touring Car Championship season. 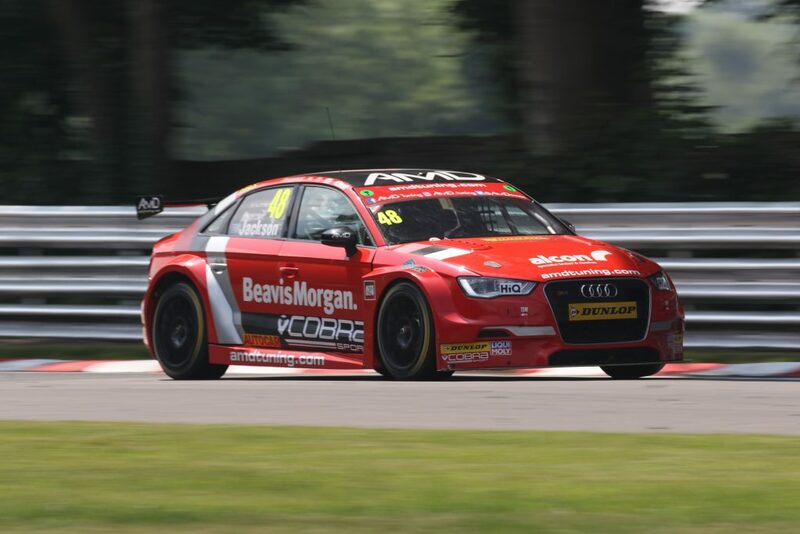 The West Thurrock-based outfit made the long trip to Cheshire hoping to challenge for points at a circuit where the Audi S3 had been strong twelve months ago. Tamworth based Ollie Jackson led the team’s challenge in qualifying to put his car 18th on the grid, with his best lap just eighth tenths of a second off pole in the ultra-competitive field. 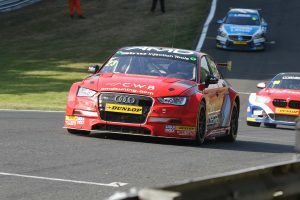 A battling drive in the opening race saw Ollie rewarded with a points finish in 14th after a heated fight in the midfield, with the 34-year-old managing to beat title hopeful Tom Ingram in a drag race to the line. Running the soft compound tyre in race two, Ollie produced one of the best drives of his BTCC career to date as he battled his way forwards into the top ten before going wheel-to-wheel with title hopefuls Ingram and Jack Goff. The end result was a strong ninth place finish, leaving Ollie well placed to add to his tally in race three. A good start saw him immediately jump up to seventh spot but the race would then be halted because an accident, with the grid reformed in its original positions. This time around, Ollie would fall victim to contact from the Honda of Dan Cammish on the opening lap, which resulted in a puncture and an unscheduled visit to the pits. Despite ending up down in 21st place as a result, Ollie ended the weekend as top scorer in the Jack Sears Trophy with a trip to the podium to end proceedings. Rookie team-mate Sam Smelt was left on the back foot going into race day after a difficult qualifying session saw him starting down in 31st place, with the Nottingham-based driver ending the opening race of the weekend in the same position. Making up six places on the opening lap of race two, Sam looked set to make progress through the field until contact forced him to retire with damage to the front of his car, which was fully repaired in time to take the start of race three. Avoiding the carnage ahead at the start of race, Sam produced his strongest race so far in the final race of the weekend as he broke into the top 20 for the first time, with a finish of 17th being his best to date. “The big thing this weekend is that we had a better qualifying and it left us in a position to challenge on race day. We’ve showed strong pace throughout race day on both types of tyre and have secured two good results on merit and not simply because others have gifted us places. “In the second race in particular, we were a match for anyone in the closing stages on the soft tyre and the team has done a brilliant job with the car – it was spot on. “I really need to work on my qualifying as that is what has held me back this weekend. Starting from the back of the grid it was always going to be difficult but we made some changes to the car ahead of race day that improved things and I was able to find more speed. “Even though we got on the podium at Brands Hatch, I’d say this was the best weekend we’ve had this season with the Audi. Ollie’s performance in the second race was particularly impressive as he held his own against some of the best drivers on the grid. I’m sure he could have had a top ten in race three without the contact. “It’s also good to see Sam get his best result so far in the sister car. It wasn’t an easy weekend and we know he still has a long way to go but he continues to make progress and is working his way forwards like we knew he would as the season goes on.